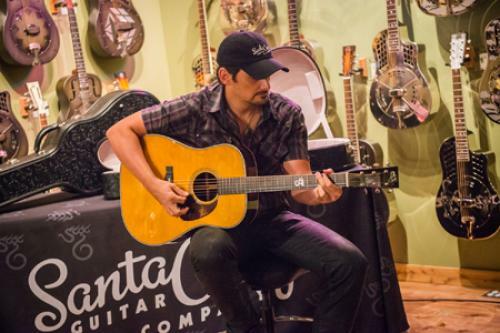 Last night Brad Paisley and Richard Hoover, CEO and founder of the Santa Cruz Guitar Company proudly introduced the Brad Paisley Signature Model Guitar to a small group of musicians and guitar enthusiasts at Artisan Guitars in Franklin, TN. 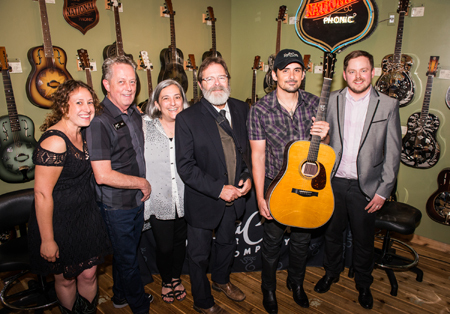 The guitar debuted at the 2015 Summer NAMM show in Nashville last week. Paisley and Hoover worked closely together to design a personalized, custom dreadnought based on SCGC’s Pre-War Dreadnought Model. The Paisley signature model (The BP/W) honors Paisley’s dedication to the sustainability of treasured tone woods, built with his preferred customizations for playability, tone and look in mind. He chose to partner with the small Santa Cruz Guitar Company, who makes approximately 600 guitars a year, from his desire to be associated with quality. He wanted his name on a handmade instrument that his fans and guitar aficionados alike could trust. Brad Paisley Signature Model B/PW Specs: Sustainable yield, master grade East Indian Rosewood and Bear Claw Sitka Spruce, 14-fret, 25.375” scale length, 1-3/4” nut width, 2-3/16” bridge spacing, custom voiced/advanced X-bracing, herringbone rosette and top purfling, Ebony peghead overlay with custom cowboy hat inlay, Vintage Tinted top, Waverly Tuners, Santa Cruz Parabolic Mid-Tension Strings, tooled leather black custom guitar case. Introductory retail price: $5,450.